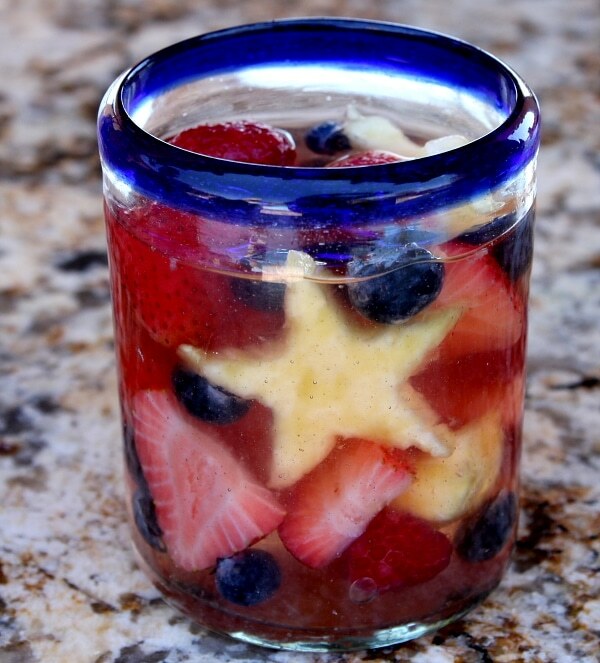 Here is an easy recipe for Red, White and Blue Sangria. It’s the perfect summer cocktail recipe with white wine, vodka, triple sec and plenty of fresh fruit. 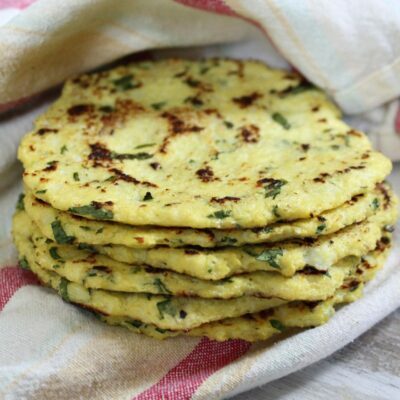 Watch the video that shows you how to make this recipe, then scroll to the bottom of this post to print out the complete recipe so you can make it at home. The big fireworks holiday will be here before you know it here in the USA, and it’s usually celebrated with festive parades, hot summer barbecues, and a whole lot of red-white-and-blue paraphernalia. 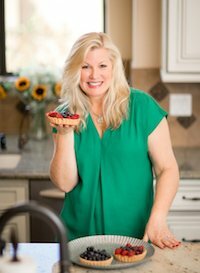 I’m a sucker for that kind of stuff, having already shared my 100 red-white-and-blue recipe links several weeks ago. 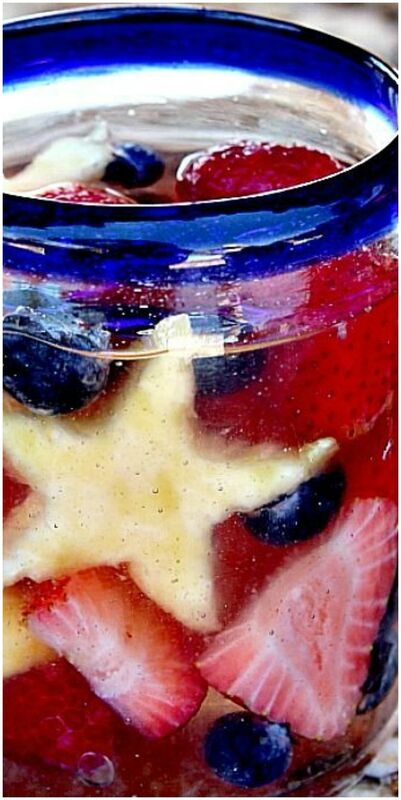 This Red, White and Blue Sangria is another one to add to the list. This recipe calls for 1/2 cup of simple syrup. You can find simple syrup near all of the mixers in liquor section of your market (or at a liquor store), or you can make it yourself. It’s super easy to do. Pour equal parts of sugar and water into a saucepan, and heat until the sugar dissolves. That creates a thick, sugary syrup known as simple syrup- used to sweeten cocktails and other beverages. However much water you use, that’s how much simple syrup you’ll end up with. 1 cup water + 1 cup sugar will make 1 cup of simple syrup. For this recipe, you just need 1/2 cup simple syrup. So you’ll heat 1/2 cup water and 1/2 cup sugar together, and then let it cool. Apparently, I’m a diva! And it looks like I might need a little botox- eek! One of the nice things about Sangria is that you can make it ahead. 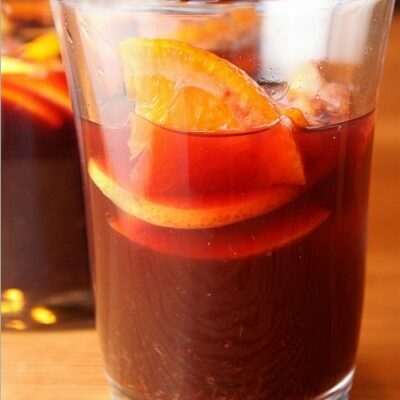 In fact, sangria actually tastes much better when you make it in the morning and serve it in the evening. Just let it chill in the refrigerator and give the fruit a chance to soak up all of the delicious flavors! I’ve even made it the night before 4th of July so it’s ready for serving by lunchtime on the 4th! 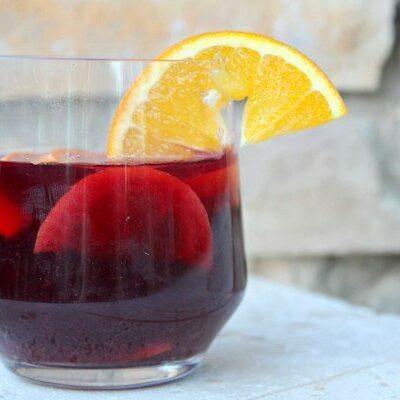 What kind of container is best for serving sangria? A pitcher will work just fine for serving sangria. But I find that I like to use a glass cylinder bowl or just a fishbowl type glass bowl for displaying sangria. It looks nice in a glass bowl, and you can just provide a ladle and let people serve themselves. 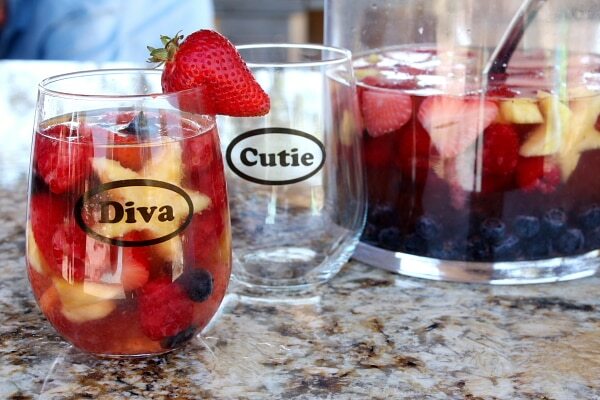 Let’s enjoy this sangria all summer long! 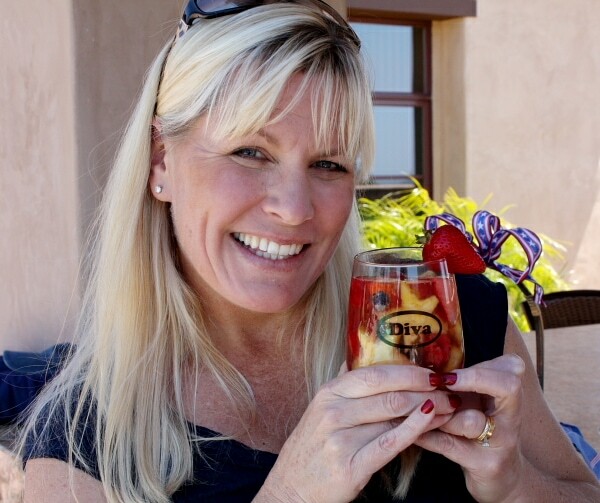 This is the perfect sangria to make all summer long! 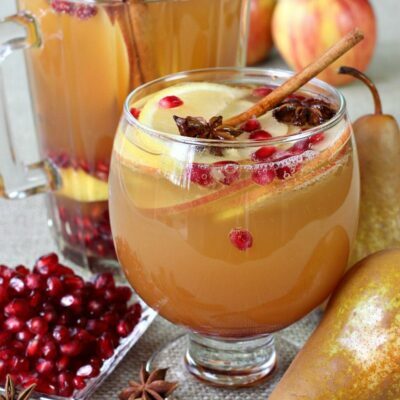 Serve well-chilled with a good scoop of fruit floating in each drink, or serve over ice. To make 1/2 cup simple syrup, boil 1/2 cup water and add 1/2 cup granulated white sugar. Turn heat to simmer and stir until dissolved. Turn off the heat and let cool. Now it's simple syrup! 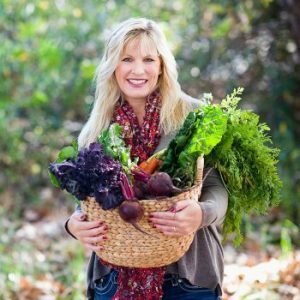 Use fresh fruit for this recipe. Frozen just won't be great. Definitely making this for my party! You DO NOT need Botox! You are beautiful! You don’t need Botox! you look great! And these drinks are darling too! YUM! 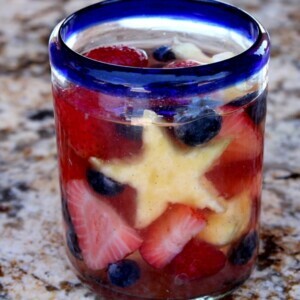 i’ve used starfruit in sangria before, would be fun (and tasty) here too and wouldn’t require a special cookie cutter! 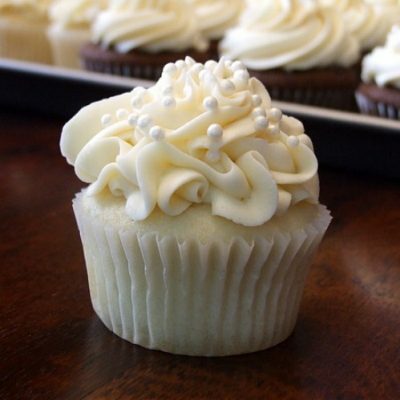 I was inspired by this recipe – especially by the pineapple stars! I made my own version and blogged about it here – http://jen.rames.org/2011/07/05/red-white-and-blue-sangria/ – thanks for the inspiration! The Sangria looks awesome! It has always been my tradition to make it for our fourth of July campout, but I never have made it look patriotic before! I just had to comment to tell you that you are gorgeous and you do not need Botox!